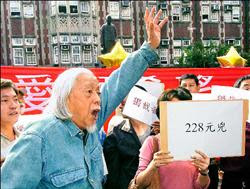 Su Beng is pictured here in a photo from The Liberty Times (a Chinese language newspaper) protesting with a pro-independence group in front of the National Normal University in Taipei. They demanded that the university dismantle the Chiang Kai-shek statue standing at the entrance. If you'd like to read the complete Chinese language article that appeared in The Liberty Times click here.